Legendary American Thrash Metallers SACRED REICH are touring North America for the first time since 2017! For Arizona based metal legends Sacred Reich, this will be their first U.S. and Canadian runs since their smashing return via the “30 Years Of Ignorance Tour” in 2017.” The upcoming tour will also see the band rejoined by their former drummer Dave McClain (ex-Machine Head), kit-man for them between 1991 and 1997, where he appeared on several singles and two full-length studio albums: ‘Independent’ (1993) and ‘Heal’ (1996). 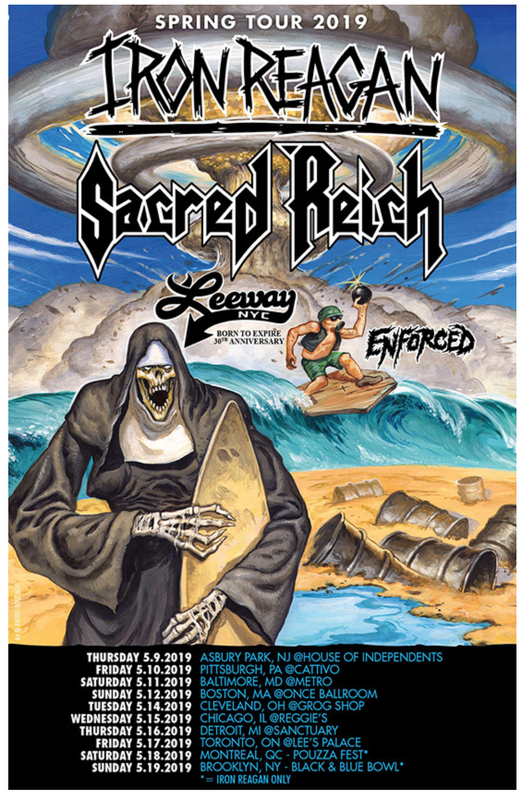 Sacred Reich is currently in the studio recording their highly anticipated new studio album – a first in 23 years – entitled Awakening, and have just announced their first string of dates in North America alongside Iron Reagan, Leeway and Enforced for May, plus European visits for festivals in July and August. See below for an overview of all upcoming Sacred Reich dates announced so far.